When it’s too hot to turn on a stove to heat water for tea, you can still enjoy your favorite tea. If you have spent months with your cold hands wrapped around a mug of warm tea, welcome to ice tea and summer. It’s the time of year again when warm days make us long for something cool to drink. We put on our cotton shirts and shorts or cool summer dresses and sandals. We sit in the shade and watch moisture bead up on the ice filled glass of tea. After taking a drink of that cooling tea liquid, all becomes right with the world. 1 How does cold brew tea work? Cold brew tea works with green, black, or oolong teas. It also works when you use herbs, flowers, and spices. Experiment with different flavors and brew times. Before long, you’ll be a cold brew tea master. How does cold brew tea work? Whether you use a tea bag or loose leaf tea, water softens the tea leaves and extracts all that lovely tea goodness. Cold brewing keeps the tea leaves from releasing as many tannins as are released when making hot tea with boiling water. Fewer tannins released in your tea means less bitterness and astringent flavor. It takes 2 to 12 hours to brew the tea in your refrigerator. The length of time to brew the tea is up to you. You can make the tea stronger by using more tea or by leaving the tea in the refrigerator longer. There is also some evidence that cold brewing tea for a long time, for example, 12 hours, brings out more antioxidants. This means more health benefits for you. For a great glass of iced tea every day, prepare the tea before you go to bed. While you’re asleep, the cold brew magic starts extracting all that tasty goodness from the tea leaves. When you wake up, making tea will be ready for you to sip and enjoy. Using spring, well, or filtered water provides a tastier glass of ice tea. If you must use tap water, it’s best to boil it to remove chemicals that can give your ice tea an off taste. Oh my, the stove just got turned on. But, if this is the only way to get better water for your tea and for you, then the sacrifice of the hot stove is worth it. Just remember to let the boiled water cool to room temperature before adding the tea and placing the container in your refrigerator. 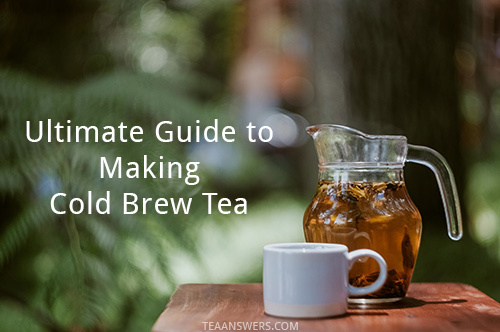 Making cold brew tea when it’s too hot to turn on a stove is simple and easy. Any tea will work as a cold brew, but using high-quality tea will give you a tastier brew. Which container to use is up to you, but glass is best, ceramic is second, and non-leachable plastic is third. Some ideas for a container are canning (mason) jars, glass or ceramic teapots, your favorite ice tea glass, and milk jars. It’s best if the container has a lid that fits. If you don’t have a lid, cover the jar with a cloth, plastic wrap or paper toweling. A lid or cover helps keep odors and airborne bacteria out of your cold brew tea. You can make tea in your refrigerator with loose leaf or tea bags. When using loose leaf tea, add the leaves to your container of choice and then add the water. You can add the leaves directly to the container or place them in a tea infuser or strainer. When adding tea leaves directly to the container, strain the tea after brewing into another clean container. Another way to make cold brew tea is to use a French Press coffee maker. My one caution is that you only use the French Press for making tea. Thoroughly wash a French Press coffee maker in hot soapy water if it was previously used for making coffee. Any vessel used to make coffee that is subsequently used to make tea can give the tea a nasty flavor. The flavor of tea made in a coffee maker is somewhere between not coffee and not tea. And no one who really wants a nice glass of iced tea will want a drink with such off-putting flavor. Tea bags work well in the cold brew tea process. No straining or spitting out left behind tea leaves required. If using tea bags with strings and paper labels, hang the strings and the paper labels over the lip of the container, using the lid to hold them in place. If your container doesn’t have a lid, you can tape the paper labels to the outside of the container. Another option is to remove the paper labels and let the strings fall into the water. Tea bag strings are regulated and are considered food safe. Sometimes, cold brewed tea looks cloudy. Even though you can still drink the tea, it isn’t as pleasing to look at. Water with a lot of minerals, such as calcium, magnesium and limestone, can cause cold brewed tea to be cloudy. High quality teas can cause cold tea to become cloudy because better quality teas contain more tannins. One option for removing cloudiness is to add hot water to the cold brewed tea after the brewing is complete. If using this option with a glass container, placing a metal knife or spoon in the container absorbs the heat, which should keep the container from breaking. Another option for removing cloudiness is to remove the cold brew from the refrigerator and let it come to room temperature before adding ice for iced tea. Have your containers and lids quite clean as tea and water can breed bacteria. To kill bacteria in water, it must be heated above 195 degrees Fahrenheit for 3-5 minutes. With cold brew tea, you don’t have to heat the water. Tea made in your refrigerator typically does not breed bacteria, but why lose a perfectly good glass of ice tea to the wee beasties. It doesn’t mean you need to sterilize your container, lid, strainer, and so on, but washing in hot soapy water and drying with a clean dry towel will go a long way to keeping those bacteria critters away. If your cold brew tea smells or tastes sour or doesn’t have a smell that you would usually associate with hot tea, don’t drink it. Bacteria have invaded your tea. If your cold brew tea looks or feels thick, almost like syrup, don’t drink it. Bacteria have moved in and set-up home in your cold brew. If you added sugar during the brewing process, bacteria now have food to eat. What a great host you are! You’ll get more wee beasties than you know what to do with, so pour that tea out. Don’t drink it. Place the tea in your container of choice. Add cold water. Cover. Place in refrigerator to brew for 2-12 hours. Remove the tea bags or strain the tea leaves. Sweeten if desired. Pour over ice and enjoy. Is it Safe to Squeeze Your Tea Bag?